James Peniston lives and works in Columbus, Ohio. His commissioned sculptures range from the the monumental (the 7-foot figure of genetics pioneer Gregor Mendel at Villanova University) to garden-sized pieces ("Water") to the tabletop (a 15-inch depiction of a favorite grandchild). James did the preliminary full-scale sculpting of Ray Kaskey's eagles for the Atlantic and Pacific pavilions at the National World War II Memorial in Washington, D.C. He also helped design the stainless steel armature that supports the baldacchino — the eagles and nearby wreaths. 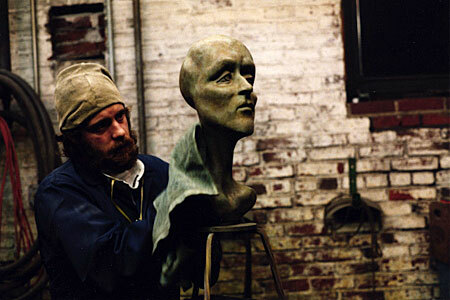 He has taught sculpture at the Philadelphia Museum of Art, The Clay Studio, and Sidwell Friends School. He has lectured on public art and community identity at LaSalle University. James is a co-founder and the arts director of Studio 34: Yoga - Healing - Arts, a center for wellness and community in West Philadelphia.